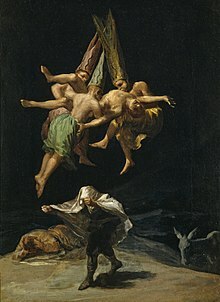 A group of criminals try to steal a very valuable painting of Francisco Goya (Vuelo de Brujas; also known as Witches in Flight or Witches in the Air ) during its auction; however in the ensuing mayhem it gets lost. Only one young auctioneer, Simon (James McAvoy), who, it is clear from almost the beginning, was in cahoots with the robbers, knows what’s happened; still, as he was also injured during the heist, he lost his memory. When neither immediate threats nor torture is able to make him remember what he’s done with the painting the intelligent boss of the gang, Franck (Vincent Cassel), decides to look for professional help; after all you deal here with a piece of art worth over 20 million pounds; every effort seems to be more than justified. Following the advice of his doctors Simon is allowed to choose a hypnotherapist and his vote goes to a posh and pretty Harley street specialist, Elizabeth Lamb (Rosario Dawson). Soon their sessions include all the group of thieves because for a reason or two it becomes clear Simon actually doesn’t want to remember anything. Slowly Elizabeth and Simon make progress but he seems to be falling in love with the attractive doctor. Franck becomes suspicious: have they known each other previously? Are they colluding? Looking for answers he visits Elizabeth in her private flat without invitation and they start a torrid relationship. Elizabeth suggests that, in order to discover the truth, she might have to seduce Simon, even if it seems blatantly unprofessional; Franck, unwillingly, agrees. Will it work, though? I do like movies directed by Danny Boyle; they usually are able to combine two features rarely seen together: entertainment and logic. 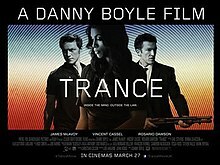 Trance, even if based on a rather thin script, didn’t disappoint me – the director never hesitated to explore more original implications of the whole story and I always like a movie with works of art included. For example in the introduction we get a short art lesson in a form of a monologue of Simon, explaining his current situation and some tricks of his trade. Then there is the stolen paintings of Goya (in reality you can admire it in Prado and I doubt they would be willing to sell), hardly a painting easy to understand. It presents partially naked witches wearing coned hats of hardened, unrepentant heretics (why? what for? ), who levitate in the night sky supporting/restraining a naked man. Two appear to be biting him, the third holds his legs as he is struggling against them. Immediately below that group a man with his head covered in a blanket stumbles forward with his arms out, holding both thumbs in his clenched fingers in a gesture of figo – the warding away of evil (obviously ineffective). From the darkness to the right, a donkey stares forward uncomprehending and unfazed while on the left another man, completely overwhelmed, lies face down clutching his ears. Does the painting represent real dangers of witchcraft? Is it an ironic warning against wilder figments of peasants’ imaginations? Or maybe it is just a witch-themed nightmare? Anyway evil women are the perpetrators here, controlling the whole scene; nobody is able to stop or prevent them from doing exactly what they want. To some extend it is also true for the character of Elizabeth Lamb who in the movie plays both sides against the middle like a real witch, her motives shadowy to the very end. Gliding calmly through the movie, Elizabeth makes it clear that 5% of the entire population might be so susceptible to subtle suggestions of a skilled hypnotherapist that they can be led to do practically everything, murder included, and then made to forget it entirely. Still it soon becomes clear that the cool Dr. Lamb, has made mistakes of her own; she carries off some risky sensual openness and keeps a rigid control over the situation almost to the very end, while the male actors are losing theirs but is really her plan so flawless? Not a masterpiece but certainly one of more interesting 2013 thrillers I managed to watch. I agree, it wasn’t perfect. Perhaps the character of Elizabeth could have been developed better. Perhaps the movie could have been made to pass the famous Bechdel test, just for the heck of it. Perhaps some violent scenes could have been cut out or edited. Still I watched it with an interest from the beginning to the very end – no mean feat for a thriller – and I enjoyed the ending as much as the beginning. If you like your crime mystery with some psychological inclinations I recommend it without any misgivings. This entry was posted in contemporary thriller/horror, movie review, psychological and tagged action, art, Danny Boyle, movie review, psychological movie, trance. Bookmark the permalink. 🙂 I knew I would. oooh, I need a good thriller in my life. Do go for it but prepare yourself for one wild ride and some quite uncomfortable scenes.